It’s like shuffleboard but with warmer coats. Curling is one of the more unusual sports of the Winter Olympic, often drawing comparisons to shuffleboard, but played on ice. Points are scored based on distance from the house, and at the end of the game, the team with the most points wins. Mark Shegelski, a professor of physics at the University of Northern British Columbia, who has also published several scientific papers on the physics of curling, helps us to break down the science of the game. 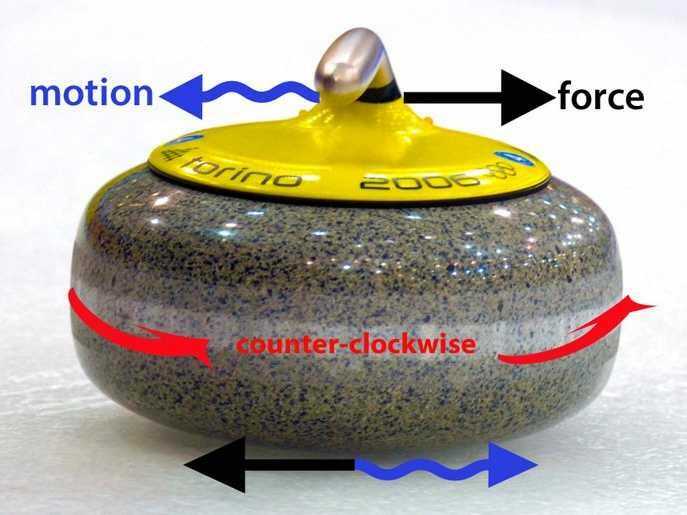 Friction (or a lack of friction) is what influences the motion of the curling rock. Friction is a force that's created when two surfaces move across each other (in this case the stone and the ice) and it always opposes the directional motion of the moving surface (in this case the rock). Friction is also dependent on the texture of both surfaces. The ice is slippery, but it still has friction that acts to slow the rock down. As the rock slows down, it gets deflected, or curls, in one direction. If the rock is rotating counter-clockwise, it will curl to the left. If it is rotating clockwise, it will curl to the right. The direction of the curl is the result of a number of things at play. Take a rock that is rotating counter-clockwise. At the front half of the stone, the direction of motion is to the left and the opposing force of friction is to the right. At the back half, the direction of motion is to the right, so the opposing force of friction is to the left. Importantly, the amount of friction at the front and back are not equal. That's because the curling stone has a tendency to tip forward as it slides down the ice. The leading half pushes down harder on the ice than the back, generating more friction at the front. If the same experiment was performed using an upside-down cup on a table, the cup would spin right because the force of friction at the back (where the sideways motion is to the right) is less than the force of friction at the front (where the sideways motion is to the left). Curling is not played on smooth ice used for sports like bobsledding or skating. Instead the surface has little bumps, called "pebbled" ice, made by spraying tiny droplets of water on the ice that freeze. "It's like a whole bunch of mounds and a lot of valleys in between," Shegelski said. The curl is too much on smooth ice, making it hard to herd the stone toward the target. Pebbled ice is used because it makes the spin controllable, according to Shegelski. In addition, the curling rock is made from a rare granite that repels water well. This "waterproof" property keeps the rock, which is slightly hallowed out on the underside, from suctioning to the surface of ice and getting stuck. In the game of curling, sweeping is critical. It's what changes the path of stone after it's thrown down the ice. Sweeping works by warming up the ice and reducing friction, which makes the rock curl less and therefore move straighter, says Shegelski. Vigorously sweeping the ice in front of the rock makes it travel a few meters farther than if the stone had continued without interference. "If a rock is shot too fast, the sweepers can't do anything. But if it's light, they can bring it where they want," said Shegelski. Sweeping also acts to clean the ice of little bits of dirt and debris that can build-up over the course of the game and catch the rock. Although shooting the rock isn't too physically demanding, sweeping requires athletes to be in good condition. The sweeper applies a lot of pressure to the ice simply by pushing his or her weight down on the broom. But "to move the brush side to side, rapidly and with high pressure," says Shegelski, "you need arm, back, and other torso muscles." Email “Here's all you need to know about curling, including why they sweep the ice”. Feedback on “Here's all you need to know about curling, including why they sweep the ice”.